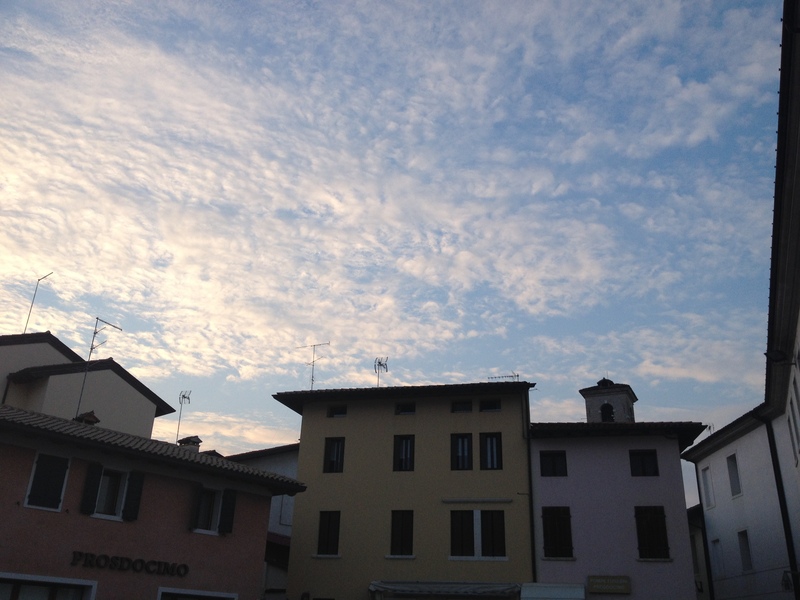 Visited the Giornate del Cinema Muto and had a lovely time, spoiled by the family with whom I stayed. Co-presented with Giorgio Bertellini, Francesco Pitassio and Luca Giuliani, the wonderful and rich Italian Silent Cinema Reader, edited by Giorgio Bertellini, and with me as author of two articles. Enjoyed Martin Loiperdinger’s birthday and new volume on Asta Nielsen. Was surprised about the smooth Domitor meeting and not surprised by the lengthy AIRSC meeting. Had big fun meeting, dining and wining with all my colleagues and friends. Liked the EFG 1914 presentation. Saw a few good films this year, such as the Swedisch comedy The Smugglers (with Pat & Patachon really funny for a change, under the direction of Gustav Molander), Beggars of Life (Louise Brooks), Gerhard Lamprecht’s tearjerker Children of No Importance/Die Unehelichen, Gennaro Righelli’s Der geheime Kurier with a dashing Iwan Mozzhukhin and remarkable mise-en-scene and photography, Pudovkin’s The Mother/Mat for the …th time, the incredible Kammerspiel thrilller Shattered/Scherben by Lupu Pick, and an early adaptation of I promessi sposi/The Bethrothed, with Gigetta Morano and shots partly on location. The found Welles, Too Much Johnson, was less than expected, but the last night with Buster Keaton and Harold Lloyd was a good if not revolutionary closing performance. Some of the sound on film scores were horrible this year, as well as some of the live accompaniments, but Stephen Horne was wonderful. Problems with the many digital projections seemed a sign of the times, now that digital projection dominates, but problems with analogue projection as well confirmed that the world did not really change that much. Finally, relying on DVD in preparation can be risky, as one German film suddenly lacked English subtitles, with the subtitlers backing out and Pordenone regulars in the audience taking over. Yet, it shows that festivals such as these cannot exist without the huge human effort behind it. And neither without funding, as was expressed on various occasions. 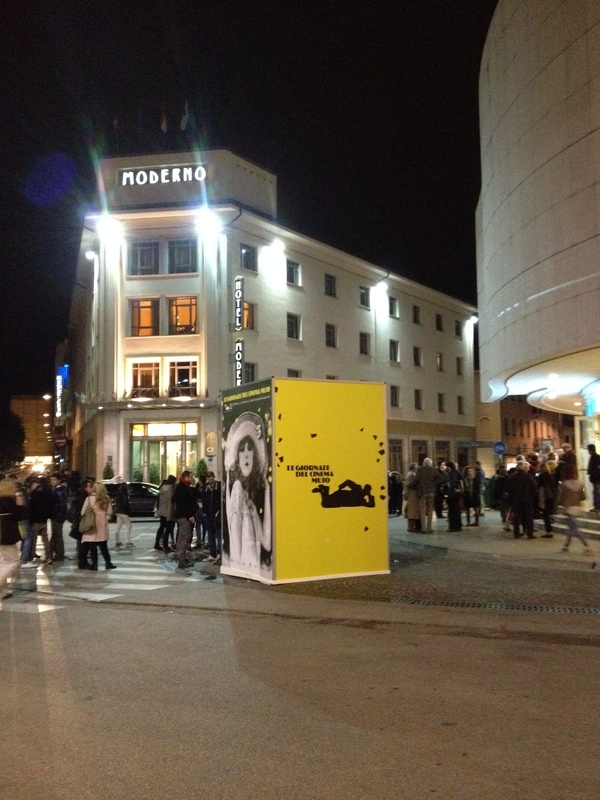 In front of the Teatro Verdi. Hotel Moderno in the back. Afterwards in Verona I gave a lecture on Romeo e Giulietta (Ugo Falena 1912), with Francesca Bertini and Gustavo Serena as the Shakespearian couple. Of course everybody knows Verona is the city of Romeo and Juliet, so I was in the “tana del leone”. And this took place at the Lyons Club Verona, at the ballroom of palazzo Castellani, in the heart of Verona. Très chic. Had a little time to stroll around, visit the museum at the Castle as well as the Duomo, and walk along the river Adige. Romeo e Giulietta was a typical Film d’Arte Italiana (FAI) production, stencil coloured, first analog restored by EYE (Netherlands Filmmuseum) in 1997, then digitally by ZZ Productions in 2003 in collaboration with EYE, Gosfilmofond, the Cineteca di Bologna et.al. Various composers were asked by Arte Television to compose new scores, a selection was broadcasted on Arte in 2003. 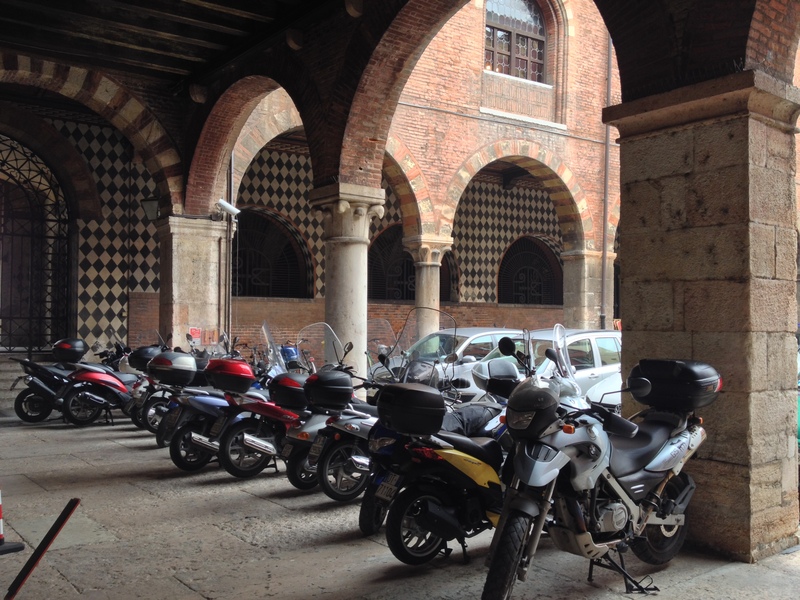 A challenge was to try and find out if the film was really shot in Verona, as FAI. Right away it was clear that all interiors were shot in the Roman studio of FAI, on which Luigi Pirandello based his novel Si gira!, later published as Quaderni di Serafino Gubbio operatore. Some of the exteriors were also clearly studio work, but some looked like as if they had been shot outdoors in real settings. Before I gave my lecture I was only able to identify one location. When the presumed dead Juliet is brough into the church, and Romeo thinks he is too late, the portal of the church reminded me of a place I had been. After endless surfing on Google Images and going through my own pictures, I found out that the real location was not Verona and neither a church. 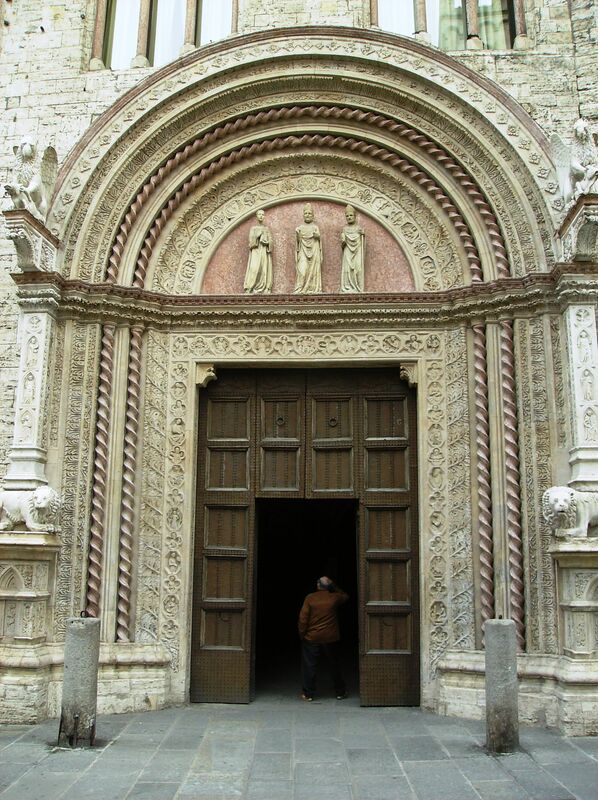 It was Palazzo dei Priori in Perugia: mark the lions at the foot of the pillars, the winged animals on top and the three bishop-like figures in the hemicircle above the door posts. Of course shooting in Perugia must have been cheaper than Verona. But the facade in the film might well have been an imitation, based on the palazzo in Perugia, reconstructed at the studio premises on the Via Nomentana in Rome. Romeo (Gustavo Serena) has returned to Verona and grieves over the death of Giulietta. The funeral cortege is entering the church. 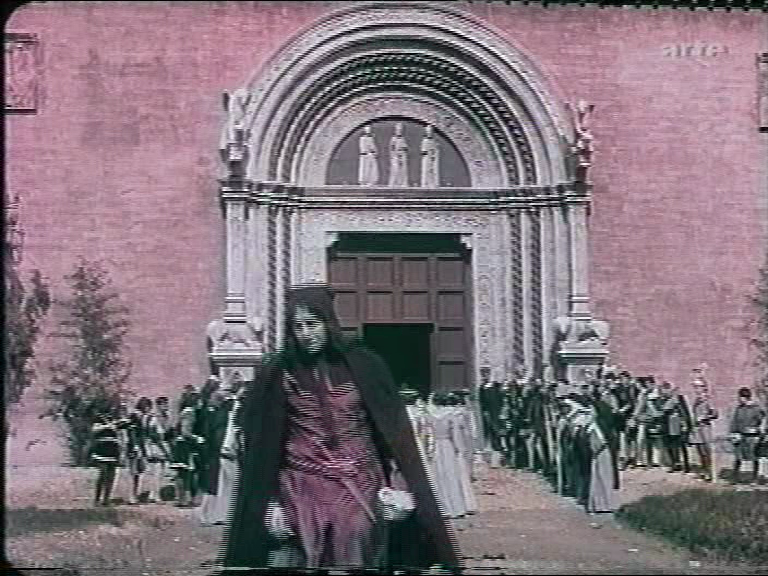 The model for the scene with the church portal in Romeo e Giulietta (1912). A second location seemed real and some of the attendants at my Verona lecture thought they recognized something but couldn’t pinpoint it. During my stroll the morning after, I casually walked into the courtyard of the Prefettura, the former Palazzo di Cansignorio, built in the 14th century and restored in the 1880s. And lo and behold, it looked quite a bit like the courtyard of Juliet’s house in the FAI production. Not exactly the same, but the checkered wall and the fat columns are a bit similar. So the Prefettura might have been a model for a studio built set. Courtyard of Giulietta’s house. Romeo and Juliet secretly meet. 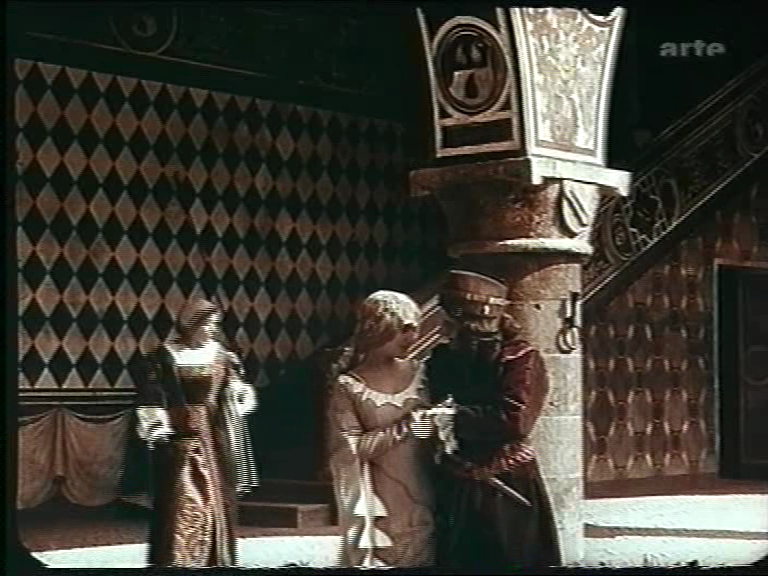 Possibly the model for the courtyard of Juliet’s house in Romeo e Giulietta (1912). 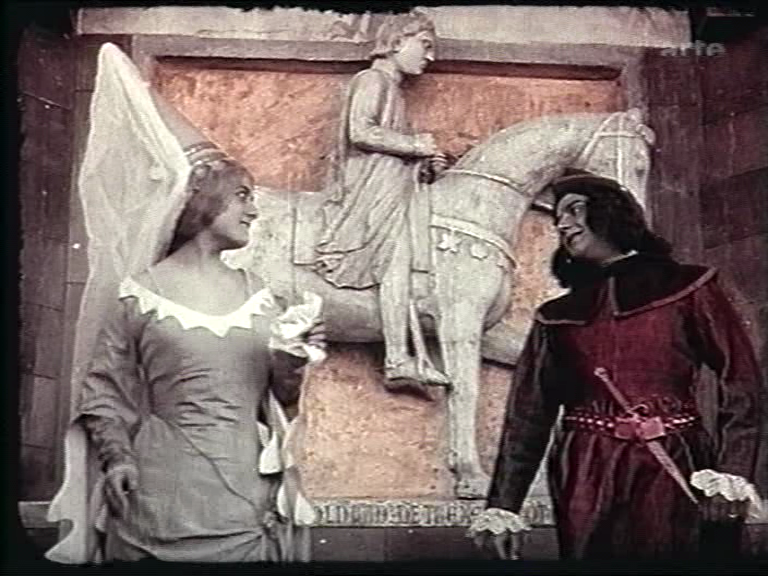 Finally, when Romeo and Juliet first meet on the stairs of her house, behind them we notice a kind of medieval or rather late Roman styled equestrian statue, in a rather course style. Moreover he is a knight without an armour. I first thought of the equestrian statues of the Verona mediëval aristocrat Cangrande but he is always presented as a knight in armour, and always as a free standing sculpture, not sculpted into a wall (basso relievo). At the Castelvecchio Museum, however, I saw a basso relievo of St. Mark and the Beggar, by the so-called Tuscan Master of 1436. Mark wears no armour, just a ‘tunica’ like the cavalier behind Romeo and Juliet. The style, though, is much more refined, classicist and Renaissance-styled, reminding of Pisanello. 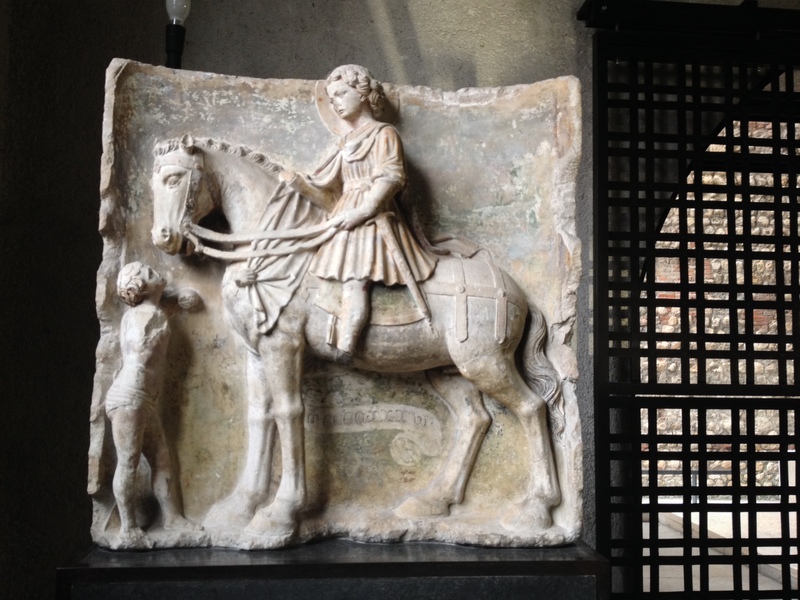 In contrast to the sculpture in the film, St. Mark’s horse does not lift one of his forelegs, which though was a classic element in equestrian statues from Antiquity on (e.g. the equestrian statue of Marcus Aurelius on the Roman Capitol). Romeo and Juliet meet for the first time. Equestrian statue in the back. ~ by Ivo Blom on October 21, 2013.